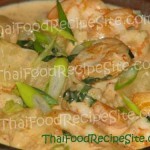 This Thai recipe, the Thai shrimp with coconut curry, is easy to make and the dish taste good. Since, I’m not an expert cook; I always asked my wife for guidance whenever I don’t know some ingredients and terminology in cooking like the term “deveined the shrimp”. She taught me how to devein the shrimp and explained to me the reason why it is needed. 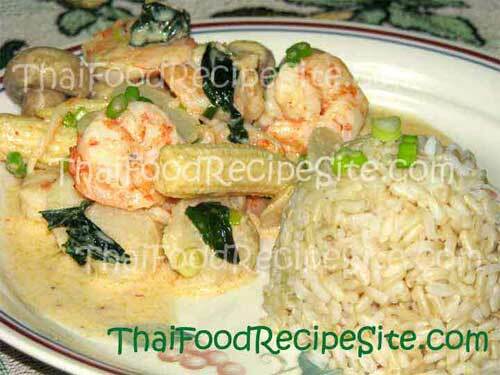 Well, I like the outcome of my cooking of this Thai shrimp with coconut curry, and my wife and kids gave me a passing grade, it’s not perfect, but they really like this Thai dish. Add the shrimp and stir-fry just until pink and curled but not cooked through, about 2 minutes. Transfer the shrimp to a plate and set aside. Skim the thick cream from the surface of the coconut milk and add it to the skillet along with the thai red curry paste. Cook, stirring, until smooth and fragrant and a bit shiny, about 1 minute. Stir in the remaining coconut milk, the lemon-grass, fish sauce, brown sugar, and salt; then simmer for 3 minutes, uncovered. Return the shrimp to the skillet along with the baby corn, scallions, water chestnuts, and straw mushrooms. Simmer until shrimp finish cookings or about 3 minutes more. Pull the pan off the heat. Stir in the basil and mint, and squeeze in the lime’s juice. 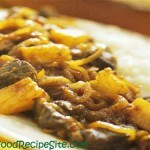 Serve with rice and sprinkle with sliced scallions, if desired.